We’d love your help. Let us know what’s wrong with this preview of A Short Guide to a Happy Life by Anna Quindlen. From the author of Blessings and Still Life with Bread Crumbs, Anna Quindlen’s classic reflection on a meaningful life is the perfect gift for graduation, or any occasion. “Life is made of moments, small pieces of silver amidst long stretches of tedium. It would be wonderful if they came to us unsummoned, but particularly in lives as busy as the ones most of us lead now, th From the author of Blessings and Still Life with Bread Crumbs, Anna Quindlen’s classic reflection on a meaningful life is the perfect gift for graduation, or any occasion. To ask other readers questions about A Short Guide to a Happy Life, please sign up. I don't read or browse through self-help books much. You get to a certain age, however (42, in my case) and, if life deals you a bad hand (over and over...and over again), the questions grow and the answers become elusive or impossible to grasp. Some on-line article or magazine mentioned this little book--talk about drifting through a day! I can't recall where I read about this. I got it from the library. Whoever wrote about it was right, it takes less than fifteen minutes to read. And while it's I don't read or browse through self-help books much. You get to a certain age, however (42, in my case) and, if life deals you a bad hand (over and over...and over again), the questions grow and the answers become elusive or impossible to grasp. Some on-line article or magazine mentioned this little book--talk about drifting through a day! I can't recall where I read about this. I got it from the library. Whoever wrote about it was right, it takes less than fifteen minutes to read. And while it's nothing earth shattering, Quindlen's simple ruminations on living a fuller, richer, happier life made me aware of the precious minutes, seconds I've let slip by with nary a notice. I was struck by one line in particular: "Think of life as a terminal illness." She's right, of course...it is terminal. This small tome has inspired continued practice of letting go of worry and fear, which only weaken and waste time. Like forgiveness, you let go several times a day, an hour. It, too, proves a difficult task, but offers priceless rewards. I will read this each day until it's due back at the library, and check it out again and again until I can afford a copy for my "one day" little library/reading room. Oh my, what a waste of 20 minutes. This book is full of cliche after cliche. Glass half empty type stuff. I learnt nothing except to avoid this author in the future. You are better off listening to Monty Python's 'Always Look On The Bright Side of Life'... more mentally stimulating than this 'guide'. This world would be a much better place if people who read books like this would look beyond their initial "cliché" reaction, and actually think about why counsel like this becomes so common. Perhaps because it reflects a deeper truth to which we should pay attention? As Quindlen says "You are the only person alive who has sole custody of your life." That being true, then counsel such as hers (whether original or not) that helps us to see what will bring happiness and joy to ourselves and others This world would be a much better place if people who read books like this would look beyond their initial "cliché" reaction, and actually think about why counsel like this becomes so common. Perhaps because it reflects a deeper truth to which we should pay attention? As Quindlen says "You are the only person alive who has sole custody of your life." That being true, then counsel such as hers (whether original or not) that helps us to see what will bring happiness and joy to ourselves and others is priceless. This small book takes minutes to read, but a wise reader will think about its teachings for far longer, and then act upon them. 1. Show up. Listen. Try to laugh. 2. You cannot be really good at your work if your work is all you are. 3. Get a life, a real life. Not a manic pursuit of the next promotion. 4. Turn off your cell phone. Keep still. Be present. 5. Get a life in which you are generous. 6. All of us want to do well, but if we do not do good too then doing well will never be enough. 7. Knowledge of our own mortality is the greatest gift God gives us. It is so easy to exist rather than to live… Unless you know a clock is 1. Show up. Listen. Try to laugh. 2. You cannot be really good at your work if your work is all you are. 3. Get a life, a real life. Not a manic pursuit of the next promotion. 4. Turn off your cell phone. Keep still. Be present. 5. Get a life in which you are generous. 6. All of us want to do well, but if we do not do good too then doing well will never be enough. 7. Knowledge of our own mortality is the greatest gift God gives us. It is so easy to exist rather than to live… Unless you know a clock is ticking. 8. We live in more luxury today than ever before. The things we have today our ancestors thought existed for just the wealthy. And yet, somehow, we are rarely grateful for all this wealth. 9. The hardest thing of all is to learn to love the journey, not the destination. 10. This is not a dress rehearsal. Today is the only guarantee you get. 11. Think of life as a terminal illness. 12. School never ends. The classroom is everywhere. Nothing really new here,but that doesn't diminish its value.Simple messages are usually the best.Lots of nice pictures to go along with lots of lovely thoughts. 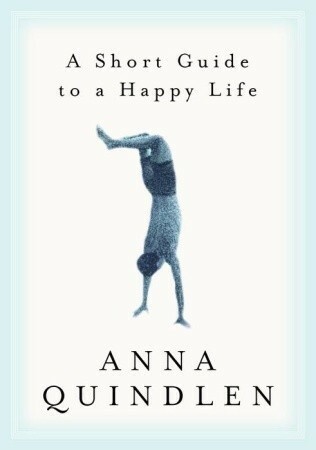 I love Anna Quindlen, and in this book she gives some advice for people who need a reminder of how to live a happy life. This week a read a few self help (full coincidence, but it was great), "get control of your life" books, don't take to hard the ups and downs etc. I loved In Conclusion, Don't Worry About It by Lauren Grahamand liked some of the advice Unf*ck yourself. Napraw się! by Gary John Bishop. Quindlen is different, she really does want to concentrate on non-work. She talks of how easy I love Anna Quindlen, and in this book she gives some advice for people who need a reminder of how to live a happy life. This week a read a few self help (full coincidence, but it was great), "get control of your life" books, don't take to hard the ups and downs etc. I loved In Conclusion, Don't Worry About It by Lauren Grahamand liked some of the advice Unf*ck yourself. Napraw się! by Gary John Bishop. Quindlen is different, she really does want to concentrate on non-work. Anna's change happened when she was in college and her mom died from cancer. She realized that life is glorious, and that we should have no business taking it for granted. And that she was never again going to be able to see life as anything except a great gift. And that we should be there, for ourselves and for others: I no longer consider myself the center of the universe. I show up. I listen. I try to laugh. Love the small things, enjoy them, embrace the little gifts of life, they are everywhere. We just need to open our eyes, and love the people around us. Get a life in which you notice the smell of salt water pushing itself on a breeze over the dunes, a life in which you stop and watch how a red-tailed hawk circles over a pond and a stand of pines. Get a life in which you pay attention to the baby as she scowls with concentration when she tries to pick up a Cheerio with her thumb and first finger. Turn off your cell phone. Turn off your regular phone, for that matter. Keep still. Be present. Get a life in which you are not alone. Find people you love, and who love you. And remember that love is not leisure, it is work. Each time I look at my diploma, I remember that I am still a student, still learning every day how to be human. Send an e-mail. Write a letter. Kiss your mom. Hug your dad. I got this for free from The Book Thing www.bookthing.org (totally worth a road trip to Baltimore). It was a quick read, encouraging readers to appreciate the simple joys in life and remember what's important in the end. Such an inspiring book! I'm happy to have read this during the darkest hours of my life! Thank you Anna Quindlen for this amazing book. I highly recommend it to someone who is missing out a lot on his life and to those who feel like the world is closing in on them. Show Up. Listen. Try to Laugh. Nothing terribly new if you are used to thinking purposefully about not taking life for granted, but a good reminder from a good writer, nonetheless. Best lines in this book: "Life is made up of moments, small pieces of glittering mica in a long stretch of gray cement. It would be wonderful if they came to us unsummoned but particularly in lives as busy as the ones most of us lead now, that won't happen. We have to teach ourselves how to make room for them, to love them, and to live, really live." I don't fully agree with it but it sounds fine. This book came out in 2000 when "work-life integration" wasn't yet coined. It debunked this obnoxiou Best lines in this book: "Life is made up of moments, small pieces of glittering mica in a long stretch of gray cement. It would be wonderful if they came to us unsummoned but particularly in lives as busy as the ones most of us lead now, that won't happen. We have to teach ourselves how to make room for them, to love them, and to live, really live." I don't fully agree with it but it sounds fine. This book came out in 2000 when "work-life integration" wasn't yet coined. It debunked this obnoxious tiring line: "No man ever said on his deathbed I wish I had spent more time in the office." Unfortunately, Quindlen also mentioned this here (p. 46). Work-life integration is making your workplace fulfill your employees' purpose (mission/vision) in life. For example, surveys say that millennials prefer to work in companies that do community projects. Not the annual trips to the orphanages or home for the aged but companies that have successfully woven social consciousness into the fabric of the employees' lives in the office. I also had an office mate, God bless her soul, who the day she died, told her mum that she wanted to go to the office to help closing the company books. She was one of our accountants and year-end has always been a busy day for their team and she was concerned about her team mates who were her closest friends. I now suspect that whoever originally said those words was from decades past and someone in the first world (rich country) where people can retire comfortably with some money left to their children when they're gone. For us Filipinos, work is life. Take a man's job away and he is no longer himself. Whether we like it our not, our work defines us. We get fulfillment in life by working. And if a person loves his job, work ceases to be work but fun like doing a hobby. Anna Quindlen is one of my favourite writers. I love her fiction and, having read a number of her novels, sought out some of her non-fiction pieces. A Short Guide to a Happy Life gives us a lovely little lesson in how to live deeply everyday, making the most of every moment. Having lost her mother at the age of nineteen, Quindlen became very aware of the preciousness of life and in this wonderful short book, advises us all to never take things for granted. This has a number of little pearls of wisdom. Some, you will already have heard (quotes from a US Senator and John Lennon) and most that are Quindlen's own. Her words are as beautiful and as touching as always, and the images within the book are very sweet. Quindlen's approach is an interesting one. She believes that one can learn to be happy. "Think of life as a terminal illness, because, if you do, you will live it with joy and passion, as you ought to do." This is something I've been thinking a lot about lately; happiness. More and more, I have been believing that happiness is, in fact, a choice. You might find Quindlen's view of life as a terminal illness odd, but either way the overarching message is very clear: Love the journey. Enjoy the view. Anna Quindlen is one of my favorite author's and she has kept her position with this story story. She won me over my Junior year of high school in AP Lit when we read How Reading Changed My Life and it was true, reading had changed my life. In this book she takes the time out to explain how we; the earth, as a whole forget how to live in the moment. We're always striving for the next best thing, or something else that will make us more happy than what we already have, when in reality we could fu Anna Quindlen is one of my favorite author's and she has kept her position with this story story. She won me over my Junior year of high school in AP Lit when we read How Reading Changed My Life and it was true, reading had changed my life. In this book she takes the time out to explain how we; the earth, as a whole forget how to live in the moment. We're always striving for the next best thing, or something else that will make us more happy than what we already have, when in reality we could fulfill all our needs just by paying the slightest bit of attention to the world and the people around us. There are so many beautiful things that we take for granted, and so many people we love that don't get enough attention from us. It's definitely something to think about and try to rectify. Short and sweet. If you are familiar with Anna Quindlen's work, she doesn't disappoint here. Her voice comes through clearly and consistently. Her perspective is non-judgmental and approachable. She punctuates herself so simply, I am always left surprised such an order of words could initiate a deep internal conversation for me. "It's so much easier to write a resume than to craft a spirit." She doesn't spend the time talking about those who are happy vs. those who aren't and why- which is what Short and sweet. If you are familiar with Anna Quindlen's work, she doesn't disappoint here. Her voice comes through clearly and consistently. Her perspective is non-judgmental and approachable. She punctuates herself so simply, I am always left surprised such an order of words could initiate a deep internal conversation for me. "It's so much easier to write a resume than to craft a spirit." She doesn't spend the time talking about those who are happy vs. those who aren't and why- which is what I find happens with a lot of these sort of books. She is just offering an enlightened reminder of what we forget all to often- life is short, be grateful and appreciate even the smallest miracles, privileges, feelings. Love, love, love this. I picked it up at the library because it looked like a quick and interesting read, but it's really so much more. It's a celebration of all the little things in life, a reminder to slow down and savor the journey. Maybe it's because in the past two years, I've become a mother and lost my grandfather (one of the most important people in my life), but I have become a huge, cheesy advocate for making the most of your life and spreading the love around. This would be a great gr Love, love, love this. I picked it up at the library because it looked like a quick and interesting read, but it's really so much more. It's a celebration of all the little things in life, a reminder to slow down and savor the journey. Maybe it's because in the past two years, I've become a mother and lost my grandfather (one of the most important people in my life), but I have become a huge, cheesy advocate for making the most of your life and spreading the love around. This book is titled A Short Guide to a Happy Life, and Quindlen’s not kidding about the “short” part: fifty pages, all double-spaced with huge margins, many of those pages filled with beautiful photography. I kind of wished it was longer. When I read I Am a Mother (Jane Clayson Johnson), I was struck by the number of quotes from Anna Quindlen. Her name sounded familiar — I know I’ve run across her quotations elsewhere before (though I can’t exactly remember where). I perused the library catalog and picked this book of hers (there were several — she’s a writer!) to put on hold. The message in this was a beautiful one: life is in the moments, and we should enjoy the simplicity of them. Don’t get so caught up in your to-do list or your job that you miss out on what’s really important. I think of [my life:] in all its small component parts: the snowdrops, the daffodils; the feeling of one of my kids sitting close beside me on the couch; the way my husband looks when he reads with the lamp behind him; fettuccine Alfredo; fudge; Gone with the Wind, Pride and Prejudice. Life is made up of moments, small pieces of glittering mica in a long stretch of gray cement. I really think this short book is a big waste of money. I received it this weekend as a birthday gift. I read it in one short setting as it is only about 45 pages long, mostly pictures. I did not think there was anything of value here. I guess the message is "be grateful for what you have"? She should feel grateful that anyone would throw down $13 or more for this. Please don't waste your money. There is little to no content here. "All of us want to do well. But if we do not do good, too, then doing well will never be enough." Her perception of life changed dramatically when her mother died. She talks about life before and life after. My life changed when I was diagnosed with cancer and my perception has never been the same. Her words are positive and hopeful. Wise words to live by. A great way to spend 15 minutes of your life! This was an extremely quick read, but so many quotes in it that I really love. I will probably definitely read the whole thing again (seriously <30 minutes) and write down some thoughts. Uplifting, inspirational....a vitamin B12 shot for spirit! A few times each year, my husband makes a 3 hour drive to Kansas City for the express purpose of unearthing book treasures at the quirky Steel's Bookstore. It's semi-organized, but includes enough messy stacks to create the feeling you are excavating for a valuable prize. After about an hour, I have had enough, while my husband is just getting started. This time, I settled into an Adirondack chair outside the front door and picked up the first book that lay within reach. It was this little jewel A few times each year, my husband makes a 3 hour drive to Kansas City for the express purpose of unearthing book treasures at the quirky Steel's Bookstore. It's semi-organized, but includes enough messy stacks to create the feeling you are excavating for a valuable prize. After about an hour, I have had enough, while my husband is just getting started. This time, I settled into an Adirondack chair outside the front door and picked up the first book that lay within reach. It was this little jewel, and I read it leisurely in about 15 minutes. "Think of life as a terminal illness, because, if you do, you will live it with joy and passion, as it ought to be lived." Anna's life falls neatly into 2 segments, "before" and "after." The death of her mother, when Anna was 19, created the dividing factor. This indeliably changed her perception of time and gave her the urgency to love, laugh, and delight in each precious moment. I loved this book so much that I gave it out as the gift at our wedding reception. I reread it recently and while I still really like it, it hasn't held up as well as some books. It seems a bit overly sentimental in places to me now. Still a very worthwhile read and lovely sentiments. Kurz, aber treffend das Essentielle auf den Punkt gebracht - stimmig ergänzt durch einige Bilder. Enthält nichts überraschendes, eigentlich erfährt man schon auf dem rückseitigen Text den ganzen Inhalt. Die Schwarz-Weiß-Bilder im Buch sind teilweise wirklich stimmungsvoll. "I listen. I laugh. I show up." "It is so easy to exist instead of live." It is an unspoken rule of mine that self-help books are to be avoided at all costs. It just seems to me that there are just some things that cannot be helped with a book, and people presuming they can change or improve my life in 300 hundred pages or less is a bit disconcerting. Of course, that is just my opinion, and anyone is welcome to disagree with me. That being said, I gave A Short Guide to a Happy Life a chance, though not my usual choice of book, because it was very kindly gifted to me It is an unspoken rule of mine that self-help books are to be avoided at all costs. It just seems to me that there are just some things that cannot be helped with a book, and people presuming they can change or improve my life in 300 hundred pages or less is a bit disconcerting. Of course, that is just my opinion, and anyone is welcome to disagree with me. That being said, I gave A Short Guide to a Happy Life a chance, though not my usual choice of book, because it was very kindly gifted to me by my (now) former journalism teacher. Having read Anna Quindlen's best seller, I realize now that it only belongs on my self-help shelf for lack of a better place to put it. I also found it surprisingly practical and thoughtful. Quindlen offer concise and honest advice on how to life a happy life in just 50 pages (or less if you discount the pictures). Best of all, she does not presume to know any more about the subject than her readers, confessing to still be a student in life. Quindlen emphasizes the importance of being a good daughter, sister, friend, and partner instead of solely focusing on being successful in your career. “You cannot be really first-rate at your work if your work is all you are," she advises. I could not agree more. I'm currently reading another Anna Quindlen's book, but since this one became available I picked it up from the library and read in 15 minutes and then re-read it. It's tiny, just a few pages. People wrote some negative reviews about it. Said that it was full of clichés. Maybe. But then again, this book was really Anna Quindlen's graduation speech, printed and decorated with some cute photographs. And there are so many self-help books and guides to a happy living right now that it's really not eas I'm currently reading another Anna Quindlen's book, but since this one became available I picked it up from the library and read in 15 minutes and then re-read it. It's tiny, just a few pages. And there are so many self-help books and guides to a happy living right now that it's really not easy to come up with something new and different. Everything seems cliché. Maybe hearing something positive, even if it's cliché and has been said before, is not such a bad thing after all?